Let the Gears of Fate turn!!!!!! Recommendations - I highly recommend this anime to everyone even to those who just started Cardfight Vanguard. I will tell you that if this is your first time watching Cardfight Vanguard. You will kind be confused on how the game works. Also the plot for this season starts off great but do not expect it to start off like a bang with them showing full duel matches like the previous seasons. Cardfight Vanguard G: A shame that the plot doesn't know what it wants to do with itself. 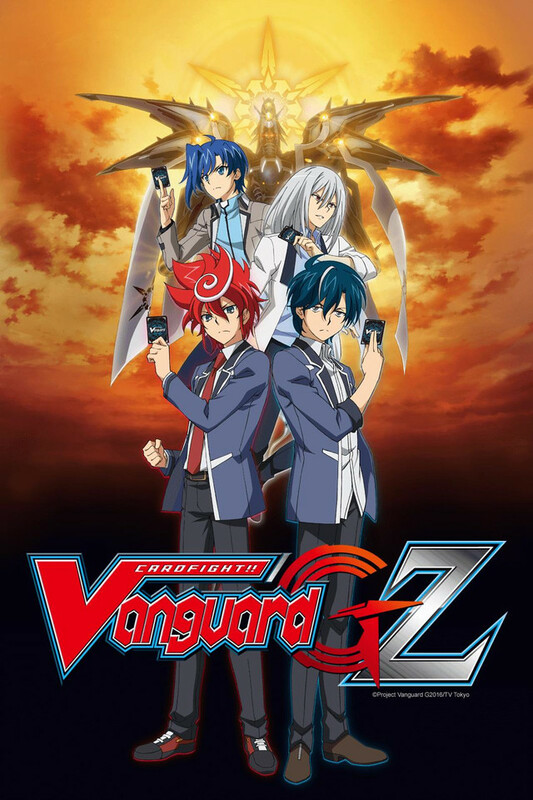 I should probably start off by saying that I am a fan of both the card game that this anime is based on and the original "Cardfight Vanguard" anime series that G is a spin-off/continuation of. I'm not the biggest player, but I can definitely say playing it in college with some friends in the cafeteria was always a great time. As for the anime, it wasn't exactly something I would call brilliant, but it can say it had a decent cast of characters, a fairly good plot (even if a lot of parts of it were predictable), and average animation. However, if there is anything the original series (at least up to Season 3, but we'll talk about Season 4 later) had that made it work well enough for me to actually call it enjoyable: it would be its consistancy. If you actually look back at the first few episodes of season one, it's actually pretty humorous and amusing that the characters are actually just sitting in folding chairs playing with trading cards on a table. Usually in these trading card advertisement shows, the characters are playing the games right off the bat in ways that are larger than real life, which isn't a bad thing, but there is something charming to how a show can start off in a really human place. The original series had a great strength in keeping the characters' situations at least feasibly in the realm of possible with a few fantasy/Syfi twists the show would slowly build up to to help better integrate them into the story. As for the characters, Aichi (the original series main protagonist) can be a bit annoying a first with how over-the-top shy and submissive the writers made him at the beginning, but I believe it ends with a great pay off. Over the course of the show, you can see Aichi's character actually changing over the course of the show to the point where the Aichi in episode 1 and the Aichi in episode 65 (the season 1 final episode) are two completely different characters just from how much they've grown and I love shows that can genuinely pull off character development like this. The other character in the show that also visably changes is Kai who starts off as a jerk who acts like he doesn't enjoy being around other people to someone who appreciates the friends he has around him, even if he'd never admit it aloud. As for the rest of the cast.... well, aside from Ren who did make an amusing villain, they're honestly pretty generic. Misaki and Kamui technically have character arcs over the course of the story, but they very much feel like the same character from when we're first introduced to them to where they end up at the end of the season. However, I will at least give points that I can at least remember the names of the supporting cast and remember what their role in the story was, even if it wasn't all that important in the end. So, what does this have to do with Vanguard G? Well, to be perfectly honest, I've seen the series up to near the end of season 3 (stride gate), and I honestly have trouble remembering any of the new characters in this show. Want to know what I mean? Here's an exercise: Aside from Tokoha, Chrono, and Shion (the three main characters who are present on the show's cover), see how long it takes you to name five characters in this show who did not appear in the original series. Or better yet, name one member of the "Trinity Dragon" group that keeps following the main characters around and have seen to have taken the place of the comic reliefs of the series. There are probably those out there who have an easier time with this exercise than me, but man do these characters really not stick with me. I believe the reason that the characters in this show just don't have enough of an identity to stick with me is because they don't feel very developed from episode one to near the end of season three. Yes, they're goals and what they're currently dealing with in the show change, but the way they act and talk are practically the same start to finish. Chrono's whole deal (I think) was that he was bored and looking for a purpose, which he finds in the card game at the end of episode one. Great, but I honestly cannot tell you what has chnaged in Chrono's character in the slightest since then. Like I said before, what he's doing in the show right now and the enemies he's facing change, but if I was to take a pair of scissors and cut out the Chrono from the end of episode one and lay it beside the Chrono near the end of season three, I'd honestly have to take a few minutes to sit down, have a nice tea, and try to figure out what the difference between these two characters I've just cut out are. Tokoha and Shion have it worse, as it honestly feels like they have a rope tied around their ankles and get dragged along where Chrono goes with little identity of their own. The only times when I can honestly say Tokoha goes off to do her own thing are when she's following her archetype of "the girl" of the story and the same can be said for Shion in the role of the "rich kid" archetype. Like I said, they do have their own story arcs, but they're so generic and uninteresting that you almost forget they even had them in the first place. An interesting thing to note is that the original characters of Cardfight Vanguard do make cameos in this show in a "passing of the torch" kind of sense, and I will be fair to G and say that this was a good move. However, it also kind of feels like these old characters are showing up not because they're important to the story, but to just walk on screen practically waving around a sign that says "remember me? I was in the first show; isn't it cool I get to be here too?" It's like tossing sprinkles onto ice cream, only to find out the sprinkles and tasteless and in the end add litterally no value to what you're getting. As for the supporting characters........ I honestly can't think of how to properly introduce them as I barely can remember who they are. I'm going to leave this part of the review short, as I feel it speaks about my feelings about the supporting characters by itself. Moving on from the characters, the debatably most important part of the "Cardfight Vanguard" anime series is the "Cardfight Vanguard" card game itself. How does Cardfight Vanguard G present these battles? Actually, the animation is fairly good, and I can fairly say that the music is very energized and feels very appropriate in a fight scene. However, and you all knew this was coming, I do have just one very big problem with these battles. A big part of the reason I watch this anime in the first place is to get the big scoop on the new sets of cards being released as I am interested in seeing how the new mechanics work. However, Vanguard G seems to favor using its 22 or so minutes of episode time on character interactions, and then throwing a big fight at the end with little explanation as to what's happening. This does start to get a bit less problematic once you're past the first season, but it's incredibly noticeable in season one. If you're not interested in learning about the new cards and techniques being released for the actual card game in the future, then you might not mind this as much as I did. Finally, let's talk about the plot. Remember how I said I felt the first three seasons of Cardfight Vanguard's original series were pretty down to earth and simple. Well, let me tell you what happens in season 4 of the original series, and this isn't a spoiler if you want to watch G. In season 4 of Cardfight Vanguard, the main character, the high school main character mind you, creates a secret star base on the moon, amassed a team of four highly trained card fighters who he then gives super powers, and erases the memories of his own existence from all his friends minds (except Kais). Now, you might be wondering, how did Aichi do all this.... And man, do I have the same question as it is practically all hand waved as "ehhhhh, he used link joker's power or something." We actually never get a clear explanation as to how he did all that stuff, stuff he did off-screen I should add, and this is a theme that seems to continue into Cardfight Vanguard G.
When Vanguard G strays away from its slice of life episodes, which I'll talk about later, there is a lot of hand waving that happens in this show. This is incredibly more noticeable in season two and three, but there are moments in season one where things happen and the show seems to expect you not to question it as it doesn't want to explain it. I won't get into specifics, but there is a scene where an adult bad guy kills himself in front of our heroes. And after he is presumed dead, he gets thrown into a vat of green goo and he comes back to life as a 10 year old child. Now you might be wondering, how on earth does that work? Well, the show doesn't even explain, and weirdly enough, none of our heroes seem to care when they find out that apparently reincarnation is a thing in this universe. Chrono meets this bad guy and all he says is "oh, neat. Let's battle again!" I promise you, it only gets stranger and makes less sense as the plot continues to unweave itself. I think a part of the reason the show suffers from this problem is that it really doesn't know what kind of story it wants to tell. I'm all for shows that can present me with more than one type of experience, but Cardfight Vanguard G feels more like a show with a split-personality disorder. Sometimes it'll want to be very go-lucky happy slice of life and the next episode will have our main characters crying over their a very problems with transitions between these two scenarios in these two episodes that'll kind of leave you scratching your head. Well, for example: remember that bad guy who turned himself into a 10 year old. Well, in one episode, he basically walks up to Chrono in the park and says "I'm evil and I'm going to explain to you my plan that will ruin you and your friends lives. Now let's fight." Smash cut to these two characters having coffee and breakfast in Chrono's house with me having no idea of how on earth we got from point A to point B.
I could keep going on for a lot longer about all the little things this show does that just doesn't work for me, but I believe it's past time to draw this to a close. Overall, Cardfight Vanguard G is a disappointing show with average animation and good music, but flat characters and a plot that leaves you with more questions than answers. so then, as this is 10 episodes in, i think its time for a review to be posted. I'm on episode 28 EPISODE 28!!!!! As a huge Vanguard fan I am SEVERELY disappointed. They are already at the tournament stage and I'm still not getting full fights. how can you even consider this a card game anime. The characters are still flat. I only watch to see if it will get any better. It would have so much more potential if they simply had full fights and based on other reviews, I'm surprised this made it to a second season. I'm still holding onto hope that maybe it gets better. The MC is fighting an old fight and rival but the whole fight still isn't being shown, you've got to be kidding me. Unlike the original CFV and CFV Asia circuit, CFV:G seeks to cater towards a more shonen approach and forgo any adherence to the actual card game rules, completely skipping over many turns and turning the game into a glorified action flick, something that the original cardfight series is nothing compared to. If you like watching monsters beat up eachother with arbitrary numbers, be my guest and watch the heck out of this, but if you liked vanguard because it wasn't like yugioh and actually had solid rules that people would follow, you're going to wanna skip this series, it does nothing but sully the great reputation vanguard originally had. I personally love CFV G, the character writing is really strong, and it feels a lot more grounded in reality even compared to the original series (imo). I love Chrono, Shion and Tokoha too. G NEXT hasn't been as strong, but i think that's because of the U20 arc (long, drawn out tournaments get dull, think Asia Circuit in the original series). Overall would recommend giving this show a chance! Vanguard G is nowhere near as good as the original. It just doesn't feel the same without a lot of the original characters. They brought a lot of characters back but only a 1 or 2 of them made major appearances. Also, the cardfights are way too fast and when there's a fight going on I struggle to actually focus on what's going on. Stride Gate DEFINITELY went too far. Plots are great in the show but in Stride Gate they let that take over both the quality and quantity of cardfights. I wish I got to know the characters a lot better but they then quickly got stuck in situations and separated. Overall, Cardfight!! Vanguard G has it's merits but... IT RUINED THE FRANCHISE! I think Bushiroad should start another generation as a clean slate and fix all the mistakes they made. The show Cardfight!! Vangaurd G was awesome and can't wait till the 6 installment comes out and hope that this has a good ending. All I have to say about this series is that it is one of my favorite shows and all though it was slow at the start it picked up fast and made the story interesting. Hope this ends in a fantastic cardfight and now I got to watch episode 44. That's it fro this review and LIBERATE THE GENERATION ZONE Chrono and have fun doing it. Exactly what a sequel should be. Vanguard G skips ahead a few years from the end of Legion-Mate and has a new protagonist; Chrono Shindou. He finds a deck of vanguard cards with a map that leads him to Card Capital's new shop. From there, the story is set in motion. The Characters. At the start, the characters seem to be rather generic but grow on you as the series progresses. Series 3 is almost entirely focused on character development. Many of the original characters make cameo appearances throughout the series. The Cardfights. At the start of the first series, the cardfights take a back seat to the introduction of new characters. However about 10 episodes in, they become more lengthy and understandable. Episode 26 of series one is pretty much a tutorial to the card game. The voice acting. The Japanese Dub has superior voice acting to the English series. The actors convey the emotions of the characters much better. An example would be Season 2 episode 32-35, a very emotional part of the season. Overall... If you've seen the first series, this is a good anime to watch next. If not, watch it first to get a better idea of the universe.